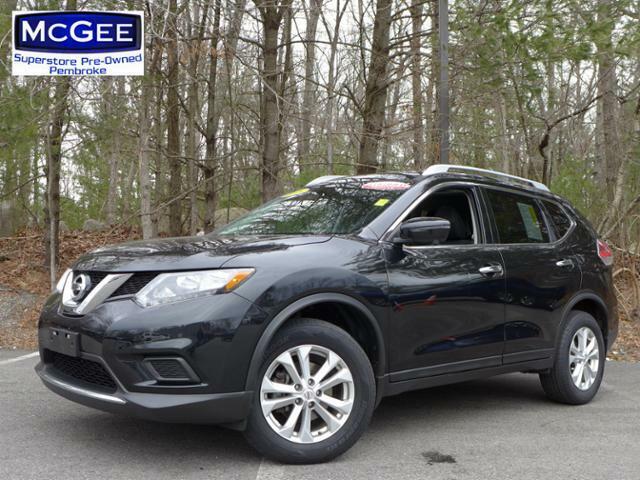 2016 Nissan Rogue SV - McGee 136 Point Certified Inspection, GREAT MILES 24,689! WAS $21,845, EPA 32 MPG Hwy/25 MPG City! NAV, Sunroof, Heated Seats, All Wheel Drive, Keyless Start, Dual Zone A/C, [U01] SV PREMIUM PACKAGE, [J01] SV MOONROOF PACKAGE AND MORE! Aluminum Wheels Rear Spoiler, Keyless Entry, Privacy Glass, Steering Wheel Controls, Child Safety Locks. SV PREMIUM PACKAGE: safety shield technologies, Blind Spot Warning, moving object detection, Heated Outside Mirrors, AroundView Monitor, Power Liftgate, Radio: AM/FM/CD/RDS/AUX NissanConnect w/Navigation, mobile apps, Nissan navigation w/voice guidance, 7 color touch screen display, Nissan voice recognition for navigation and audio, SiriusXMTraffic, SiriusXM Travel Link (Weather, Fuel prices, Movie listings, Stock info and Sports Scores) and Siri Eyes Free, SV MOONROOF PACKAGE: Power Panoramic Moonroof. Nissan SV with Magnetic Black exterior and Charcoal interior features a 4 Cylinder Engine with 170 HP at 6000 RPM*. Clean Autocheck Report! Autocheck 1 Owner, Remainder of Drivetrain Warranty.